Triumph Surveys – Caracle Creek International Consulting Inc. 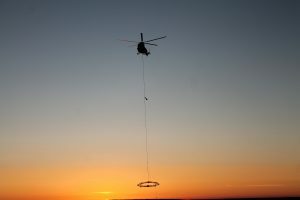 Triumph Instruments, through its related company Triumph Surveys, offers airborne geophysical surveys featuring helicopter-borne systems for detecting conductive, magnetic and naturally radioactive features. 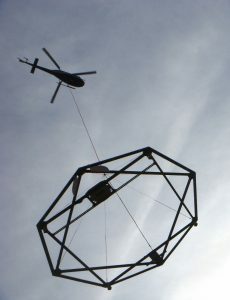 Triumph’s AirTEM system is a helicopter time domain electromagnetic (HTEM) platform that can be configured for rugged surveys in high altitudes or for deep exploration to 500 m. Ancillary equipment includes total field magnetometer, radar altimeter and high sensitivity GPS. Triumph Surveys has conducted electromagnetic, radiometric and magnetic surveys under extreme conditions in countries such as Mexico, Peru, China and Canada. Installations have been approved for AS350 B2, FX-2 and B3 helicopters as well as the Bell 407 and the SA315B Lama. Triumph team returns to base in MI-8 after successful 330 line-km flight for gold mineralization in Northern Kazakhstan.